We’d love your help. Let us know what’s wrong with this preview of Happily Ever After by Dana Piazzi. Featured From princesses and princes, to witches, ice queens, imaginary friends, and dorks, Happily Ever After: The Write More Publications Fractured Fairy Tale Anthology has it all! Seven unforgettable stories by seven talented authors! Some stories are fractured takes on classics, while others are originals that will stay with you long after you've turned the last page! To ask other readers questions about Happily Ever After, please sign up. Seven short stories – all with happily-ever-after endings – what more could you ask for? From fairytale revisions to modern-day romances, the Happily Ever After: The Write More Publications Fractured Fairy Tale Anthology has something for everyone who loves a good romance. There is even one non-romantic tale thrown into the mix. Each story was written with care by one of the seven different authors and presented beautifully within its own universe. I enjoyed all of the stories. The sweet Cindere Seven short stories – all with happily-ever-after endings – what more could you ask for? From fairytale revisions to modern-day romances, the Happily Ever After: The Write More Publications Fractured Fairy Tale Anthology has something for everyone who loves a good romance. There is even one non-romantic tale thrown into the mix. Each story was written with care by one of the seven different authors and presented beautifully within its own universe. I enjoyed all of the stories. The sweet Cinderella story with two princes to choose from. The imaginary friends inspiring a little girl. The two Snow-White-ish tales, one set in contemporary days. The tale of the fairy queen’s love and the one of the princess framed for murder. And, finally, a modern version of The Snow Queen. Each was unique and sweet. The tale I liked least was the one without romance, simply because it did not contain romance and was not directly involved in the happily-ever-after. With the others, it was too difficult to choose a favorite, because they were all so good. I would recommend this anthology to lovers of fairytale romance with a good dose of Happily Ever Afters. 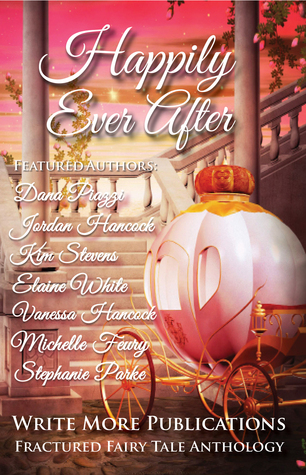 Happily Ever After is a fun anthology that is suited for lovers of fairytales. This anthology ranges from medieval to contemporary fairytales. These short stories have a different take to the fairytales that we know and love and there are a few original stories. Each of them end in a happy feel good way that will leave you gushing with happiness. One thing that I like about these stories is that they take these fairytale princesses and make them stronger. They are not the classic fairytale prin Happily Ever After is a fun anthology that is suited for lovers of fairytales. This anthology ranges from medieval to contemporary fairytales. These short stories have a different take to the fairytales that we know and love and there are a few original stories. Each of them end in a happy feel good way that will leave you gushing with happiness. One thing that I like about these stories is that they take these fairytale princesses and make them stronger. They are not the classic fairytale princesses who are damsels in distress. Instead, they can take care of themselves. They are smart and observant. Each of them are determined to make their own happiness and dreams come true. The heroines grow very confident and learn to rely on themselves. Therefore, I liked how these authors have portrayed these characters. Overall, this anthology gives us a twist on our favorite fairy tales. There were some stories that I did not like as well because I did not like their twist on a few of my favorite fairy tales, I did enjoy them all and found them entertaining. While I did not necessarily like the story, I did find them all very well-written. This anthology is filled with romance, adventure, humor, and action. My favorite stories in this anthology were “Blue Bird” by Kim Stevens, “The Legend of the Ember Bark Tree”, “Frost Bite” by Stephanie Parke. While each of these stories are different, they each end happily. This was also a very quick and easy read, and I believe that they are perfect for a bedtime story. I recommend this book for fantasy, romance, and fairytale lovers. Therefore, I suggest that you grab of cup of coffee and read this book. I promise that you will not regret it. Even though it starts out similar to the well loved tale of servant girl meets prince, this Cinderella version has a fairy godmother with an attitude and a prince who is not so charming. Even the humble brother turned advisor comes off as a bit of a cold fish. Can there be a happy ending? As a child, did you have an imaginary friend? Was it another child or an animal? Did you wonder what happened when you no longer had time for your friend? Snow White has a spoiled stepsister in the Blue Bird fair Even though it starts out similar to the well loved tale of servant girl meets prince, this Cinderella version has a fairy godmother with an attitude and a prince who is not so charming. Even the humble brother turned advisor comes off as a bit of a cold fish. Can there be a happy ending? Snow White has a spoiled stepsister in the Blue Bird fairytale. Another version the of sibling rivalry theme "if I can't have him, no one else can either." Is redemption possible? What happens when a hermit author allows each of her seven most trusted friends to set her up on a one night date? She is not looking for Mr. Perfect, just someone who will accept her as is and respect her devotion to her craft. And to Heathcliff. This is not the only manhunt you'll find in these tales. Faeries, trolls, knights, king's, true love and heartbreak. Curses! These are the elements of real fairytale. But sometimes a girl can only count on her trusty unicorn. Fancifully imagined and wonderfully expressed this collection of reformed tales is magical. I have really enjoyed diving into this anthology. I love fairy tales and good retellings/takes off of them. Each story in this anthology was a great take on one of the old classics. Each other taking a completely different story and making it into so,etching very fresh, exciting and unique. I zoomed through this read, as I fell for the first story and just couldn't stop reading. Every reading moment I had for a few days was given to this. I felt like each story did well to really bring Loved this! I zoomed through this read, as I fell for the first story and just couldn't stop reading. Every reading moment I had for a few days was given to this. I felt like each story did well to really bring to life the tale and the world in which it took place. I liked that each author made a point to be very descriptive, in both world and character, as it made me a part of each, and I became very invested in each. I liked that all of the characters were given lots of detail, both in personality and visually. This made each one very real and really brought out what type of character they were and which side they fell on. Overall, I was very imposed by this anthology and highly recommend it to any who love fairy tales or their retellings. This book gives you warm fuzzies. Seriously, if you’re looking for fuzzzies and warmth and cuddling and feeling good, this is what you should read. Set in a fairy tale – esque background with humor, fantasy and romance, this anthology is perfect for an afternoon read snuggled in your bed as you dream about your Prince Charming. I am a unrecovering book addict. I have loved reading all my life, and don't plan on changing that. Recently, I have found that I enjoy writing just as much as reading. I have just had my first published short story, and hope to continue writing and getting more works published. Meanwhile I will be devouring books like candy, and working on growing in my own writing.